The goal of the Iberia Parish Early Childhood Community Network is to provide parents with access to high quality early childhood learning experiences and programs for infants to five year olds so they enter Kindergarten prepared. 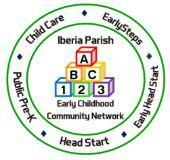 Together, the Iberia Parish Early Childhood Community Network is....CARING, CONNECTED, and COMMITTED. Children who enter Kindergarten with the critical cognitive, social-emotional, and learning skills — the fundamental building blocks for learning to read, write, and do math — are more likely to succeed in school, in college, and in their career. Louisiana is in a multi-year effort to unify its early childhood system and improve kindergarten readiness. By empowering families with choice and ensuring access to high-quality options, the state seeks to start every child on track for success. To implement Act 3, the Department called on communities to create Community Networks comprised of child care, Head Start, publicly funded private preschools, and public school Pre-K under a unified system of academic development standards, enrollment, and teacher preparation expectations.